Manchuria (Northeast China) is the homeland of the Manchu people. To the Chinese, the region is simply known as the Northeast (Chinese: 东北, Dōngbĕi). Manchuria is made up of China's three northeastern most provinces: Liaoning, Jilin, and Heilongjiang. Parts of Manchuria were annexed by the Russian Empire in the past, and they are now ruled by Russia. Manchuria is a translation of the Chinese word Manzhou (Chinese: 滿洲, Mǎnzhōu). 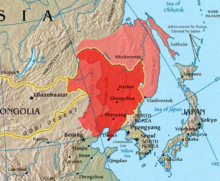 In the early history, Manchuria was under the control of many Chinese kingdoms. Later, the Manchu people formed their own empire called Jurchen. They eventually invaded China and founded the Chinese Qing Dynasty. Although China signed a treaty with Russia, the Russians took advantage of the weak Qing government and annexed the part that touches the Pacific Ocean, where the modern Chinese city of Dalian stands today. Japan then attacked the Russians to take this important piece of land. Later, Japan invaded the Chinese part of Manchuria too (see Manchukuo). This eventually led to World War II. After the war, Manchuria was returned to China and Russia. Manchuria is in north-east China and the Russian Far East. The land has rocks, grasslands, mountains, and deserts. The weather is very extreme. It is very hot and humid in the summer, and is very cold and dry in the winter. This page was last changed on 6 April 2019, at 06:36.